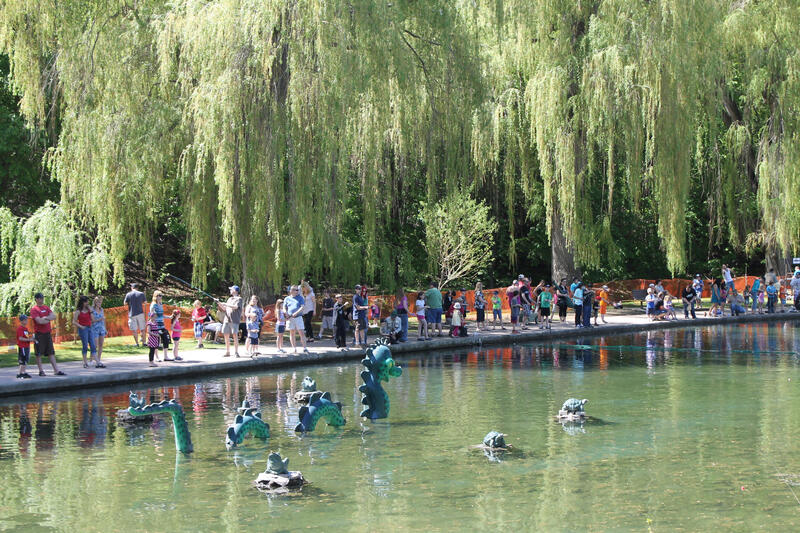 In 2001 the Kalamalka Flyfishers Society took over the Polson Park Pond Free Kids Fishing Weekend. The idea was to give kids the opportunity to go fishing, some of whom might not otherwise be able to. 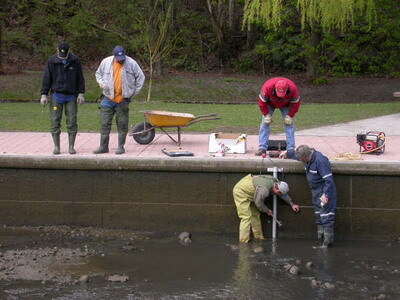 Usually, held around the first weekend in May, rain or shine, this is the Kalamalka Flyfishers Society’s biggest event. This is a free event for kids up to the age of 14. All kids must be accompanied by an adult. Kids can bring their own fishing rod and tackle or they can use ours. We can provide all the rods, tackle, including worms and it’s all for free. If you need help, that’s free too. The kids can keep 2 fish each per day and we will even clean them for you. Nothing like fresh fish for supper. There is a concession stand where you can get hotdogs, chips, pop or water for lunch. We would like to thank the Freshwater Fisheries Society of BC, who donate about 1,000 rainbow trout weighing about 3/4 of a pound for the kids to catch. 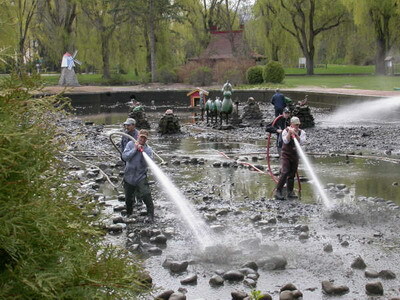 The fun starts with the cleaning of the Polson Park Duck Pond the Sunday before the big event. Come on down and watch. 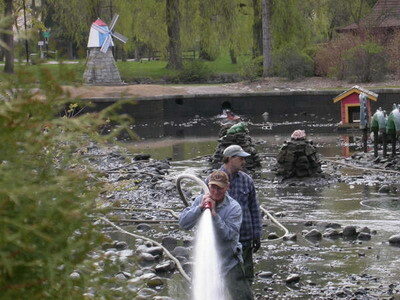 We start draining the pond about 7 am and then use fire hoses to clean out the bottom of the pond. We want the pond nice and clean for the rainbow trout when they arrive. 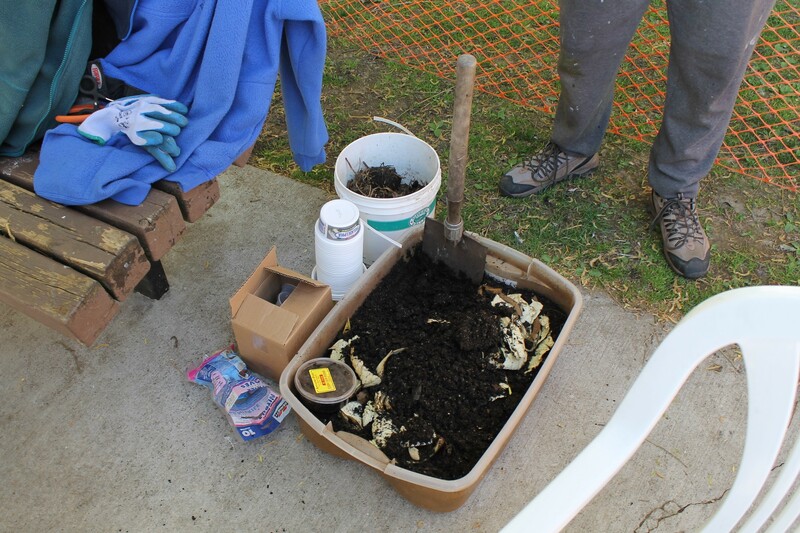 It is after all, a duck pond, and usually takes 4-5 hours to clean. 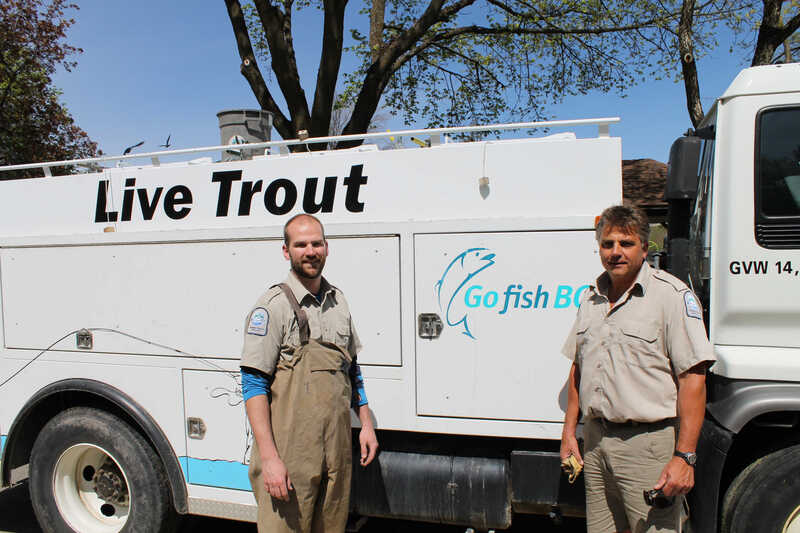 After a thorough cleaning, we string some nets up in the pond to keep the trout spread out. Once that is done, we close the gates and let the pond fill back up. Bring in the fish. 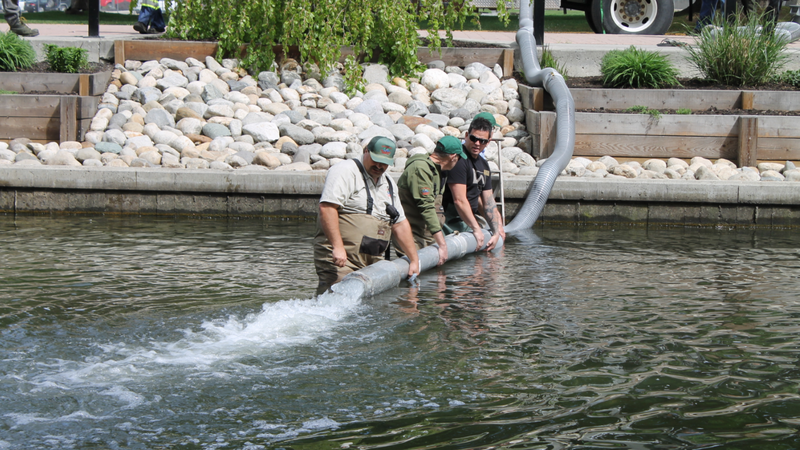 The Wednesday before, the Freshwater Fisheries Society of BC bring in and release 1,000 rainbow trout, each about 10-12 inches long, into the pond. The trout are spread out in the different areas so everyone has a chance to catch fish. 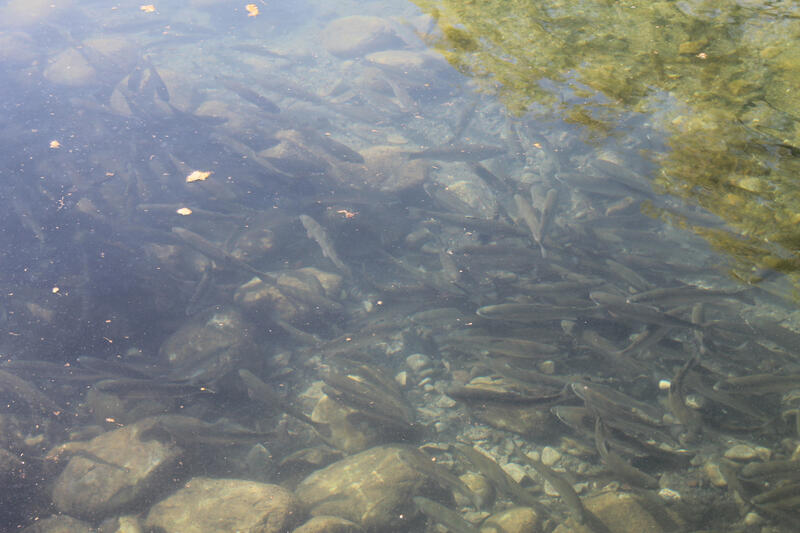 These trout are raised by the Freshwater Fisheries Society of BC at the Summerland hatchery. Check out the hatchery for tour dates and times. The fish are a little confused when they first arrive but recover quickly and start looking for something to eat. Let the fishing begin. By Saturday morning the fish are hungry and easy to catch. As the afternoon rolls around, especially if it is one of those sunny Okanagan days, the fish start looking for cover and the catching slows down a little. Sunday morning and the fish are looking for breakfast. There are always still lots of fish left to catch and they readily take the hook and worm again. If the kids are having some trouble getting the trout to bite, grab one of the Volunteers. We know a trick or two that may work. We do not want any child to go home without catching a fish. 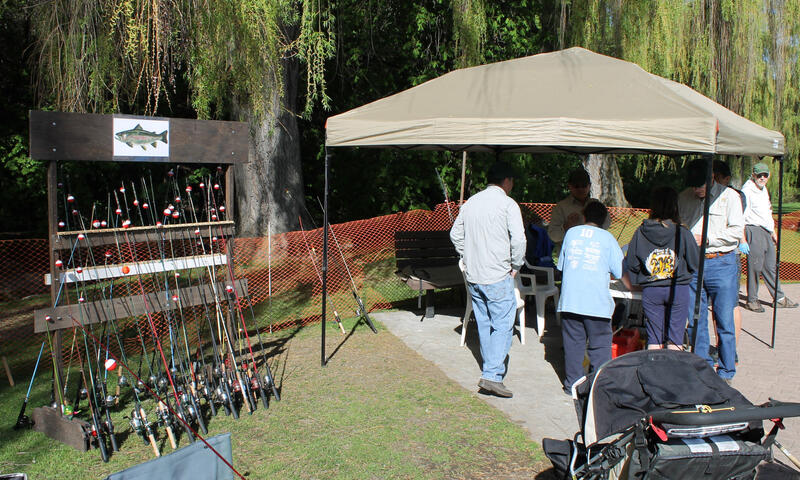 Saturday: Fishing starts at 9am to 4 pm. 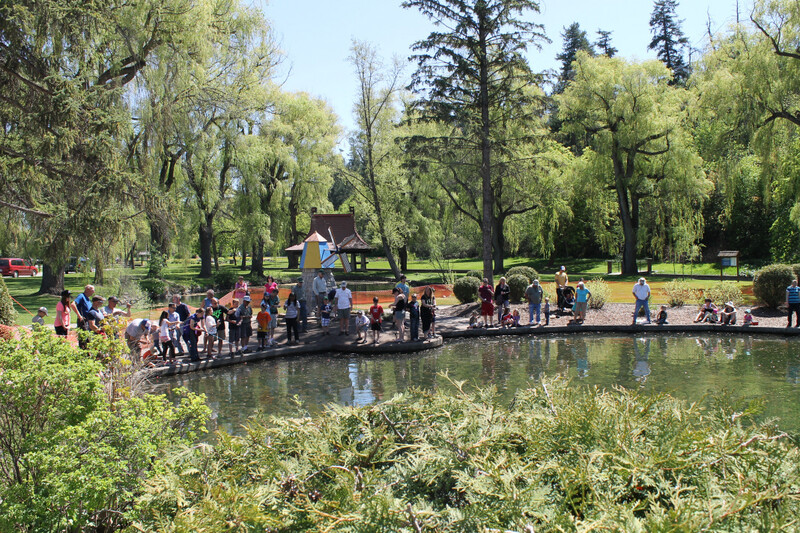 Sunday: Fishing starts at 9 am to 3 pm.